I’m beyond thrilled to be showing my work at ICP alongside a group of very talented artists, curated by the great folks at Forfreedoms. If any of y’all are in NYC, come through and say what up! In the aftermath of our fall 2018 50 State Initiative campaign—noted by Time as the largest creative collaboration in our nation’s history—we are celebrating the beta launch of our new digital platform with a DIY-exhibition centered around the Freedom from Fear. Curated from over 100 submissions received in under two weeks through our online open call, IT IS A MIRACLE THAT WE ARE STANDING HERE is a visionary compilation of work by emerging artists who celebrate the resilience of their communities, subvert and complicate narrow notions of contemporary identity, and investigate the altered narratives and power systems that pervade their lives. Both a celebration and an elegy, the show title—inspired by the series from selected artist John William Murphy—alludes to the forces of empowerment, love, and disenfranchisement that have brought us to where we are today. 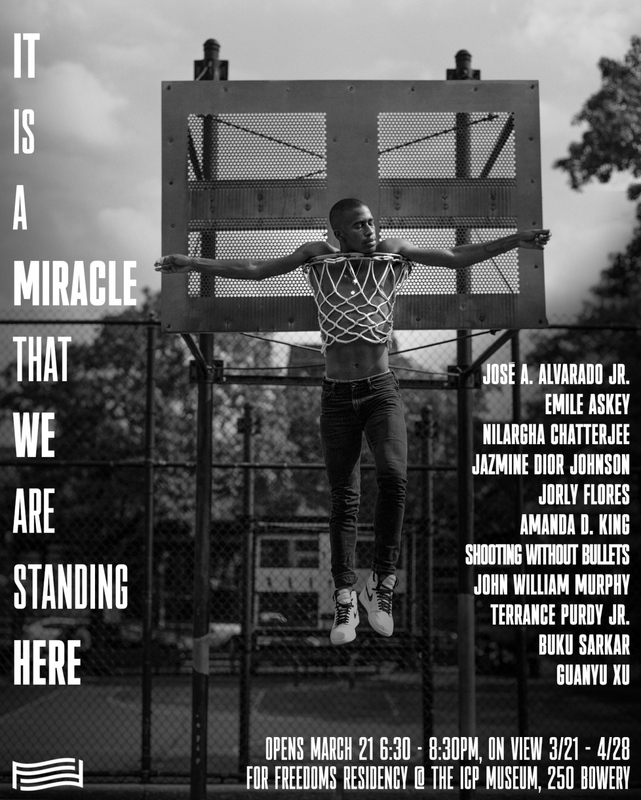 Featured artists include: José A. Alvarado Jr., Emile Askey, Nilargha Chatterjee, Jorly Flores, Jazmine Dior Johnson, Amanda D. King x Shooting Without Bullets, John William Murphy, Terrance Purdy Jr., Buku Sarkar, and Guanyu Xu.